Every single one of us has been given gifts by God. Every.single.one.of.us! My gifts are great empathy, compassion, the ability to feel very deeply, and the ability to run our home smoothly. As humans, we tend to compare ourselves to others and think that the grass is always greener in someone else's pasture. We do this with our gifts. We look at those who are beyond crafty, those who are talented with singing, those who are organized to the wazoo, those who are math nerds (umm, I mean geniuses! ), those who are gifted teachers, those who are great caregivers, etc. and wish we had what they have. Sadly, we beat ourselves up over it. I think that is the nasty devil trying to get us to focus on what we aren't instead of who we are. If he can get us to want what other's have, then we won't use our gifts to honor God and His Kingdom. That makes him happy. Remember friends, we NEVER want him to be happy. Our gifts are those things that come naturally to us. They are the things that bring us joy and give us a full heart. It took me a LONG time to realize what my gifts are. I was involved in a Bible study and would email various ladies letting them know I was praying for them. I opened my heart and showed great empathy for those hurting and desired to help in some way. A beautiful young lady (she was 80) who has a great heart for Jesus pulled me aside and told me these were great gifts from Jesus. She encouraged me and counseled me on using them for God's Kingdom. She assured me that they were great blessings and not to let anyone squash them. I am forever grateful to her for loving me enough to talk with me about my gifts. Since then, I have embraced my gifts and am no longer ashamed of them or embarrassed to share them. I get great joy out of the gifts that my sweet Jesus covered me in. Do you know what your gifts are? If not, take time to recognize what brings your heart joy and fulfillment. Journal about what brings you great peace and satisfaction. What stirs your heart so greatly that you can barely contain it? Pray for clarity and encouragement in sharing them with those around you. 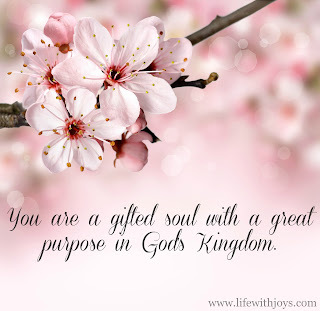 Your gifts are unique to you. May you embrace them and share them with great love for Jesus and those around you. Love to all of you and may your gifts shine like the beauties you all are!